Few sites can boast the history of Intertops, a site which hopes to show that its future is just as bright as its past. With a massive amount of content and plenty of style, first impressions look good for one of internet gaming’s greatest pioneers. One of the first things you’ll see when you click on the Intertops website – which is beautifully designed – is the operator proudly proclaiming that they’ve been online for 23 years. Well, that and the option to choose your sign up bonus, which includes 200%, 100% and 50% options. And it’s understandable why they would want to shout their origins from the digital rooftops. Very few can claim to have been around since 1996, long before most of us had internet connections. There’s a level of trust that goes along with being a site that has managed to remain in good standing for that long. After a near quarter of a century, they must be doing something right. On the other hand, is it possible that in all this time they’ve fallen behind the curve? To find out whether Intertops is as strong as ever, or is beginning to show its age, check out the rest of our review. 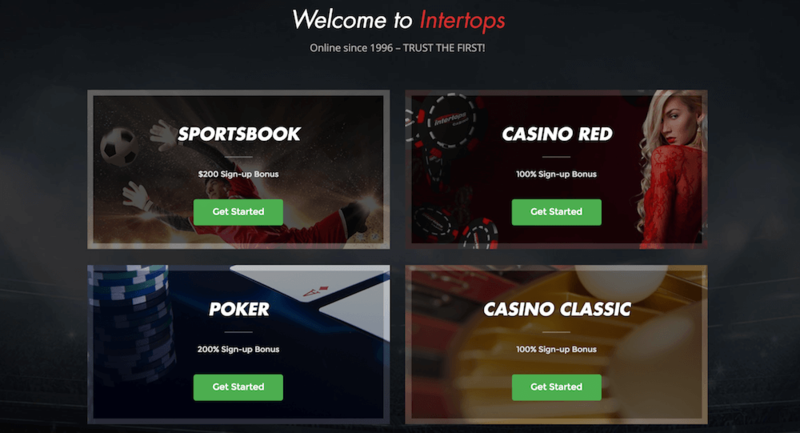 There are plenty of promotions available throughout Intertops, both on its sportsbook and casino. That means there’s no shortage of options for those looking for something a little extra. Here. we’re going to take a look at just a select few but do keep in mind that promotions are subject to change. Nonetheless, this should give you a good indication of the type of quality that’s available on the site. Also, while we are giving an overview of some important terms and conditions, the full details are available on the site itself. Choose Your Sign Up Bonus: This is an interesting twist on your usual welcome bonus, as you get the option to tweak your percentages and rollover requirements – all of which are fairly generous. At the 50% bonus up to $200, you’ll have to roll over your bonus and deposit 4x. At 100% up to $100, the rollover is 6x and at 200% up to $50, the rollover is 8x, with minimum odds of 1.5. Overall, it’s a great opening offer. $20 Sign Up Free Bet: Here’s another one to entice new potential customers. If you wager $20, you’ll receive a $20 bet token, with a rollover requirement of 16x. Considering that is so similar to the Choose Your Sign Up Bonus options, and less value, we’re not sure what use this is despite being an objectively decent offer. Parlay Free Bets: If you place a parlay bet with a minimum of four selection and a minimum total odds of 4.00 then you lose by one selection, you will receive a ticket to a weekly draw for a $50 free bet. This free bet must also be wagered 16x to be redeemed $1k Monthly Parlay Prince: The winner of the highest net profit from a single parlay bet will receive a $1,000 dollar bonus without any rollover requirements. Refer a Friend, Earn Real Money: If you refer a friend to the Intertops site, you can earn commission through the affiliate program – a whopping 35% commission in fact on what is paid out monthly. It’s a mixed bag of promotions for sure. However, we do think there is plenty of value – especially with the very generous welcome bonus options – to make Intertops’ promotional options a success in providing an incentive to join and in making the overall experience a more enjoyable one. One area in which Intertops does not fall behind is in its variety. 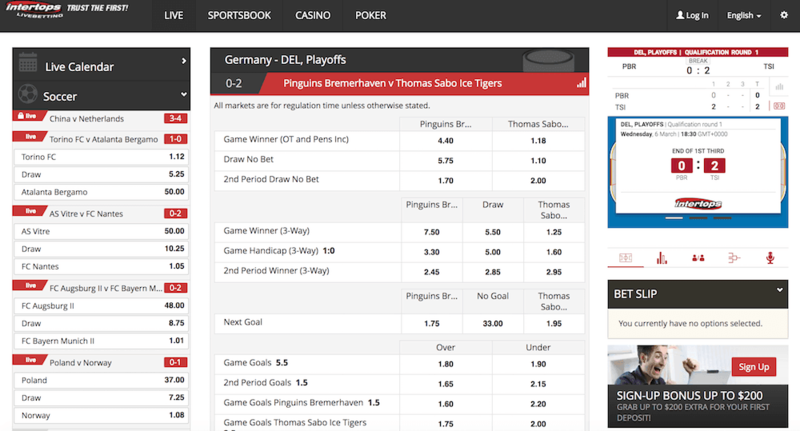 Here you have a sportsbook, casino, live casino and even a dedicated poker section. And each one of these is positively bubbling away with content. On the sportsbook side of things, you’ll find a very wide selection of sports to bet on, with American football, baseball, basketball, ice hockey and tennis being top options. This suggests that the operator is a very American focused sports wise, but they also top this off with plenty of options from around the world. These include things like Aussie Rules rugby, darts, snooker, soccer and more. There are even non-traditional betting options such as e-Sports, politics and even the stock market. Not only that but the coverage for these sports is extensive. They don’t just pad out their site with sports they barely cover. For example, American football allows you to choose from the Canadian CFL and the AAF, alongside the NFL. The casino is jam-packed as well, with hundreds of options available through download and instant play. What becomes clear when you look at the variety of betting markets is that Intertops is consistently moving forward, reassuring many of our concerns about a site with their amount of history. Although there is no mobile app available, the site still works perfectly well on a small screen without one. The mobile version of the Intertops site is available for use on Apple, Android and Windows devices. Customers will find all the top content from the desktop site, along with access to the cashier, promotions and customer support. 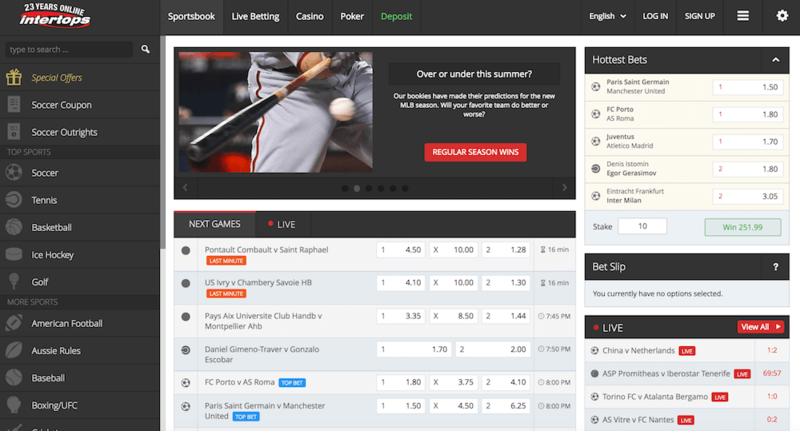 While there are plenty of options for live betting across many different sports, this is not matched with any live streaming services. There is also a lack of anything like commentary to help people follow games while on the site. We can’t criticise Intertops too harshly for this though, as very few betting sites include this option. However, it’s also fair to say that we can’t give it top marks here either. More disappointing though is the lack of virtuals, which is a rare instance of the site missing content. 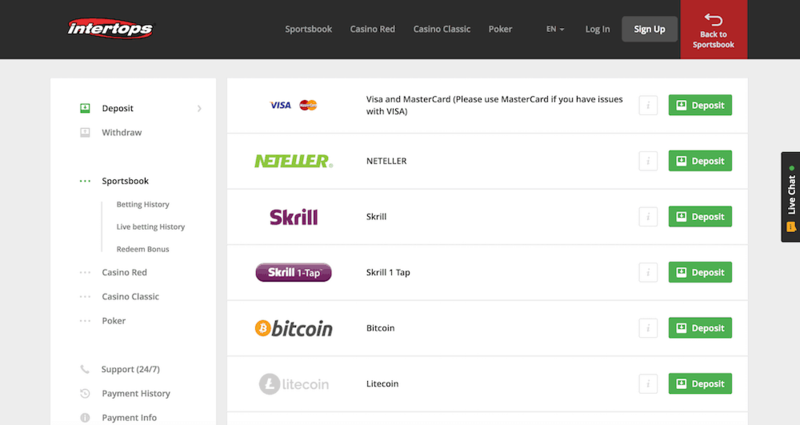 You can make deposits at Intertops via debit card, Litecoin, Money Global and even Bitcoin, and withdraw via the latter, check, bank draft, bank wire transfer, SEPA and Money Global. Further information regarding things such as fees and limits can be found via an information button next to the banking options on the site. In terms of processing times; debit cards are instant, Bitcoin takes up to 10 minutes, as can Litecoin, while Money Global can take between one to 24 hours. There are also no fees for any payment options except Money Global, which can vary. Debit cards have a maximum limit of $1,000, while Bitcoin and Litecoin have limits of between $25 and $2,500. In terms of withdrawals; Bitcoin can take 48 hours to process, checks can take up to five business days, bank draft and bank wire transfer take between 15 to 20 business days, SEPA takes between two to four business days and Global Money takes up to seven business days. Bitcoin and SEPA have no fees, while checks have a fee of $50, bank drafts have a fee of $80, bank wire transfers have a fee of $50 plus, and Money Global has fees of $85. Withdrawal limits vary depending on the payment method, with full details being available on the site. They also have information regarding identification, including the type of ID you need to verify yourself. These are pretty standard, including a valid picture ID and a recent utility bill. As you can see, the amount of information and detail provided by Intertops in terms of deposits and withdrawals is absolutely second to none. And considering how vague many sites are regarding banking details, they should be applauded for that. 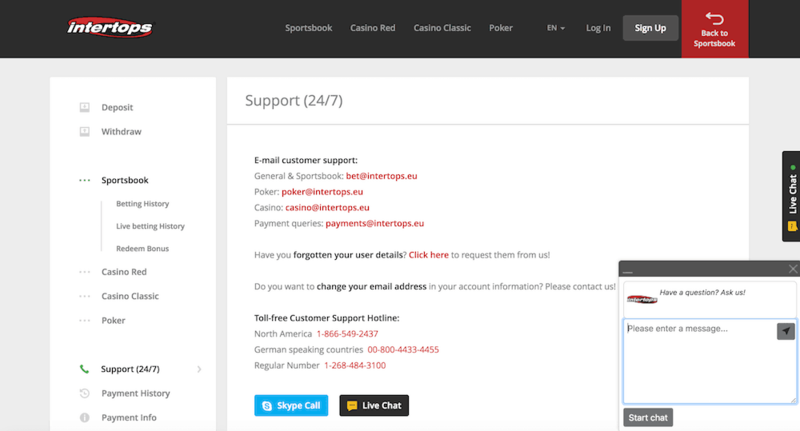 We couldn’t be much happier when it comes to Intertops’ customer support. Although it took a minute or so for a member of the team to get back to us, it was during a busy part of the day and once they were available, we found them exceptionally helpful. There’s also a North American and German-speaking line available, alongside a regular number. That’s not to mention several e-mail addresses and even a Skype call option. Top marks here. Unfortunately, this is an area in which Intertops is completely lacking in information. The only details we could get from the site and customer service is that they are registered by the government of St.Kitts and Nevis. This is a massive shame because one of the greatest selling points for a site with the history of Intertops is that their kind of background gives them a legitimacy so few others have. For them to not offer additional information locking in that reputation with licensing and encryption information is a huge disappointment. Alongside the many sports promotions, there’s also a selection of casino bonuses, including a welcome bonus. Here’s a quick look at some of the details about this offering (further details can be found on the site). 100% Welcome Bonus up to $100: Simply sign up for a casino account and enter the coupon code SIGNUP1000, then deposit a minimum of $20 to receive your bonus. This is subject to standard wagering requirements for casino bonuses, which is 30x. It’s a competitive offer if nothing spectacular. We couldn’t help but feel hugely let down by the lack of security and licensing information, which has put a dark cloud over our review. Elsewhere, Intertops was doing so well. The site is beautifully designed, easy to use and understand – with that notable exception –, and offers an overall great experience with fun games, variety and top customer service. However, Intertops cannot simply rely on its history in order to provide trust between them and its users. So, more information is required regarding those vital site elements. If we had that information and it left us feeling confident in the site’s reliability and security, we wouldn’t hesitate in recommending this site fully. As it stands though, we are left unsure, meaning there is a limit to how highly this can be rated.